PLEASE NOTE: If you are not able to click on the date that you would like your order, then that date is not available. Delivery is available only for orders over $100 (not including delivery fee) with minimum one week notice if available. Delivery available from Downtown Seattle to North Tacoma, East to Issaquah. Delivery fee will apply. PLEASE NOTE: Some one must be available to accept delivery. Food will not be left unattended. We allow 15 minutes of wait time for recipient to accept delivery. We will call you to let you know what is going on, so please be available to answer your phone. In case of non-availability of recipient at the time of delivery there will be no refund. We will leave a door notice to let the recipient know that a delivery was attempted. Repeat delivery will incur additional charges if our schedule allows or recipient can pick up the order at Sweet Themes Bakery during business hours. Please check to confirm you have read and understand. Filling out the order quote form does not commit you to ordering nor confirms your order. 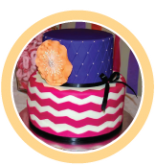 Once your quote form is received Sweet Themes Bakery will make every effort to contact you as soon as possible. Orders are not confirmed until details are verified, a quote is given and payment is received.